When Larry Page and Sergey Brin started working on a research project back in 1996, they never thought it would eventually transform into a search behemoth. Fast-forward to 2019 and even their biggest rivals are finding it hard to keep their employees from using the services provided by Google. But what made Google an omnipotent force in the search landscape? Was the success sealed by the founders who kept innovating at every stage of the company’s growth? Or did the competitors miss the bus that Google is now driving? There is no question about the advanced technologies that Google uses to update its algorithm. Google’s algorithm is the secret ingredient that made the company successful. Google has continuously put in the effort to upgrade its algorithm over the last two decades. Each time the search engine giant updates its algorithm; it has served its users with relevant, high-quality results. Recently, Google rolled out an incremental algorithm update that made many improvements in the Google search results. An algorithm update is a double-edged sword for SEO experts. This is a period when a few websites see an increase in their traffic while other sites start to decrease in the rankings. However, this time around, the update has favored sites that have already built authority in their field of expertise. 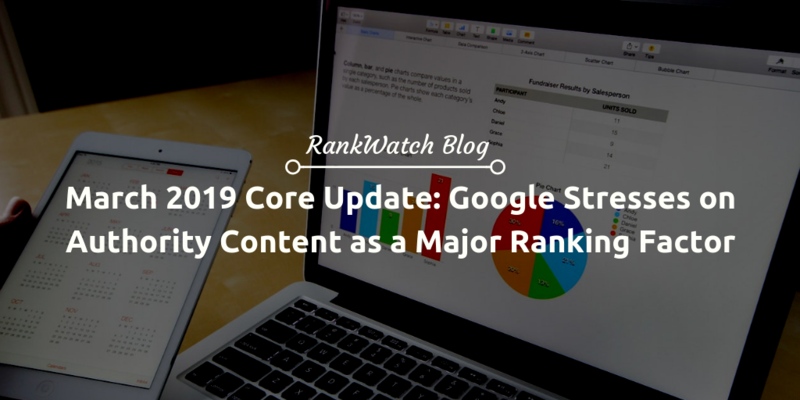 The full core algorithm update of March 2019 has been officially named the “March 2019 Core Update” by Google. It’s not the most significant update that Google has rolled out. However, the implication of this latest algorithm update from Google is far-reaching. We did a detailed analysis of the websites affected by the March 2019 Core Update. Our study found that these websites lacked the fundamental quality signals that Google has set for sites. Our analysis is based on Google’s Quality Rater Guidelines, which is now available in the public domain. This document has been helping SEO experts to find the missing trails that will lead them to the top position in the Google search. SEMRush has been providing vital information about the impact of Algorithm Updates through the SEMRush Sensor. According to the data presented in SEMRush Sensor, Finance related websites were poorly hit after the March 2019 Core Update. We analyzed one of the worst hit websites in the finance sector and found a few factors that may have resulted in the drop in rankings. This commercial website belongs to a community bank, and as you can see, the website was hit after the broad core algorithm update of August 2018. Even though the site made slight improvements after the September 2018 update, once 2019 arrived, the decline in traffic started again and now, with the March update, the traffic has touched an all-time low. As discussed earlier, Google wants to provide the best and relevant search results to its users. In the process of achieving this, the search giant also plays the role of a gatekeeper by barring a few results from coming on top of the search list. These websites are those who have failed to follow some of the practices that Google has mentioned in the Search Quality Rater Guidelines. Since finance based websites provide suggestions to the users, it’s possible that they may implement the same in their life. So Google wants to ascertain that only the best results that provide the most valid information come on top of the search results. One of the factors that Google considers while assessing the validity of the information is the authority of the author. Since the particular website that we are focusing on failed to address this specific issue, their blog pages came much below the top 10 rankings in the Google organic search. Healthcare websites were the second biggest losers after the latest Google March 2019 Core Update. Similar to finance websites, Google is also concerned about ranking Healthcare sites. According to the Google Quality Rater Guidelines, these types of websites come under the category “Your Life Your Money” or YMYL. YMYL websites are categorized based on the impact it might have on someone’s health, happiness, safety, or financial stability. The healthcare website that we analyzed is a typical YMYL site as it diagnoses ailments based on symptoms provided by the users. This particular website, which also has an app, is meant to provide solace for the people troubled with pain and illnesses. This site was getting over 20k monthly traffic after Google rolled out the birthday update in September 2018. Their happiness didn’t last long as the traffic started its descent in November. The trend continued till December, and by then, the organic traffic had gone down to less than 9k. As they thought the traffic was stabilizing, Google launched the broad core algorithm update in March pulling the traffic down further. Our in-depth review found that the site was trying to get leads by asking users to provide their health-related information in the form of a quiz. We also found that at the end of the questionnaire, the users were led to a sign-up page that requested them to provide an email ID and phone number. This practice is deemed as a spammy practice as the users are tricked into providing information about their health condition, which Google doesn’t like. We also found that the website has a practice of publishing rewritten content from authority healthcare sites. The site failed to provide any additional value to the content and in addition to this, published the content under the byline of the authority site. Rewritten content cannot be considered as a ‘trustworthy’ source as there is a possibility that errors might creep in. Google has categorically stated that rewritten and duplicate content will be considered as less trustworthy when considered for ranking on the SERP. The two case studies are an indication that Google is considering Expertise, Authority, and Trustworthiness as critical factors while determining the organic search position of websites. When dealing with YMYL websites, the webmasters have to ensure that the content that goes live gets credited to an author who is an expert in that field. If it’s a shopping cart, ensure that the website has HTTPS SSL certified and also displays Privacy, Return, Payment, etc. on the website. Do you know someone whose site is also affected by the March 2019 core update? Then, do comment below about the fluctuations you came across after this update, and shed some light on what kind of steps have you decided to take accordingly. A passionate digital marketer possessing sound grip in the fields like SEO content writing and social media. Previously, worked for a top sports website, and currently works at Stan Ventures. He loves to read books and a great admirer of Agatha Christie’s works.